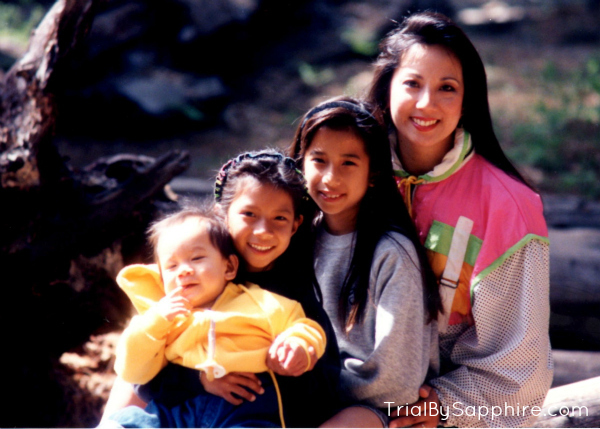 Trial By Sapphire: "I'm Going to Live Here Forever." My sister called yesterday, and I got all the details of Baby Mac's speedy arrival. (He was born within 3.5 hours of checking into the hospital!) She is doing well and completely in love with her son, of course. What an incredible experience! Hearing his small coos in the background melted my heart. I cannot wait to snuggle that little man! Summer's journey into motherhood gives a little more depth to the story I wanted to tell today. I must have been around the age I was in this photo, six or seven years old. One afternoon, I was sitting on my parents' bedroom floor, huddled near the glass sliding door. I busied myself with a sticker book while my mom was working at the desk across the room. The house was still. Somewhere in our on-and-off conversation, my mom mentioned that I would grow up and live in my own house someday. The words prior to that escape my memory, but I recall exactly how I felt when she said that. My own house? You mean, I don't get to stay here? She grinned, possibly marveling at my innocence and naïveté. "You'll live with your own family. You won't want to live with me and Dad. Trust me." "I don't want to. I'm going to live here forever." I remember the exact inflection of my voice. Soft but with the passion of a world explorer. That house was my world, and I couldn't imagine living anywhere else. I was very concerned which is probably why she chuckled. Not surprisingly, my mom was right. I did move out of the house. Twice, actually! But now I know that more than the house, it was the people in it that held, and still hold, my heart. Our familial titles have become secondary to our friendships as we've grown. I know I'm lucky, because not everyone has that. I do prefer living in my own house with my husband, but I think what I was trying to say at that very young age was actually, "I'm going to love you forever." That is still true. Congrats on becoming an Auntie. I was 15 when I became an aunt and I didn't cherish it as much as I would now. You are very lucky to have such great relationships with your family. I really felt like I was there in this moment. Thank you for sharing! I swear you were the cutest kid ever. awe beautiful!! I am very lucky to come from a fabulous home too. i feel lucky in the same way you do. i'm so glad that i'm have such a good relationship with my family; it's nice to not mind them since i still live at home! in fact i more than don't mind them, i ENJOY living with them. I used to say for a long long long time that I was just going to kick my parents out and live in the house that I grew up in. And I'd still like to do that someday. But for now, I moved abroad and am about as far away as I can possibly get. Congrats Aunt Lindsay! And Congrats to your whole family. I love this post. I think that's definitely what you meant and I'm sure your new baby family member will love you all forever, too.